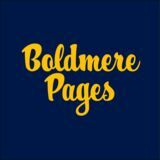 Welcome to the February/ March issue of the Boldmere Pages, packed full of local events and activities to keep all the family entertained, right through to spring. Find out more about the Deli Social’s latest venture and Boldmere’s best kept secret, Gym & Slim, plus see our pick of the best things to do locally in What’s On. 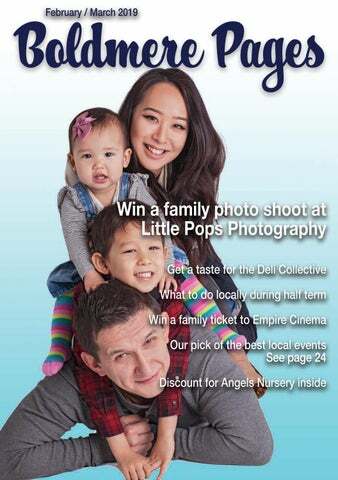 This issue we have two fantastic giveaways; two family photo shoots courtesy of Little Pops Photography and a family ticket to Empire Sutton Coldfield. If you have any feedback or suggestions, we would love to hear from you. Old school magic meets the modern world in this epic adventure. Alex thinks he’s just another nobody, until he stumbles upon the mythical Sword in the Stone, Excalibur. Gym & Slim Boldmereâ&#x20AC;&#x2122;s Best Kept Secret Gym & Slim, the ladies only gym on Union Drive, has undergone a transformation and has relaunched with a bang! Gym & Slimâ&#x20AC;&#x2122;s newly transformed space features circuit, cardio and studio zones. This range of activities is rare for female gyms, normally the focus is just on circuit and toning plates. The circuit zone features a ten station, full body workout with a three-minute buzzer sounding to signify the time to move. The cardio zone features the latest equipment including the very popular Stairmaster, cross trainers, two different types of bikes and for the first time at Gym & Slim, treadmills. The studio zone is a fully kitted out space where classes are held three times a day (Mon - Fri) and features equipment such as battle ropes - which are traditionally a male-orientated exercise but can be great for everyone, bounce - which is a gentler workout using exercise balls, and stretch, which is great for developing mobility, plus much more. Not only are the classes perfectly designed for the abilities of the group, but they are also designed to be done at home, so you never miss a class! Gym & Slim is open Monday to Friday, 8am to 8pm, and Saturday & Sunday, 9am to 2pm. These newly expanded opening times are designed so that everyone can benefit from the gym at a time that suits them. Alongside a physical workout, Gym & Slim is designed to give your mind a workout too as they organise regular social activities and workshops, and there is even a coffee area where people can socialise before or after class. We spoke to Gym & Slim’s Manager, Kerry Mann, who explained that Gym & Slim’s ethos is to nurture a friendly, supportive environment where people can come and feel part of a community. There are no contracts to sign, unlike other gyms, as she wants people to stay because they enjoy their time at Gym & Slim, not because they are contractually obliged. Come and discover one of Boldmere’s best kept secrets for yourself with a free guest visit and free induction. PLUS, right now you can benefit from no joining fee and one month free! For more information, visit gymandslim.com or pop in and see the gym for yourself. I am a locally based Independent Financial Adviser in Sutton Coldfield who specialises in Investments, Pensions and Protection. I take the time to get to know you, understand your situation and provide you with a tailor made solution to meet your financial goals. Where: The Deli Social When: 23rd February 6 - 11pm Food by Little Urban BBQ: ribs, beef brisket and jackfruit, all smoked overnight. Wide range of cocktails by Taylor, plus draught Estrella, Thatchers and hot and cold drinks. Motown and soul classics with DJ Sammy till 11pm. Read the February-March 2019 issue of the Boldmere Pages, Boldmere's favourite magazine!